After numerous requests we decided to produce a motorhome driving DVD and a 5th wheel towing DVD. I enlisted the help from professional driver and book author Lorrin Walsh. I always thought I was a good driver, but even old dogs can learn new tricks. 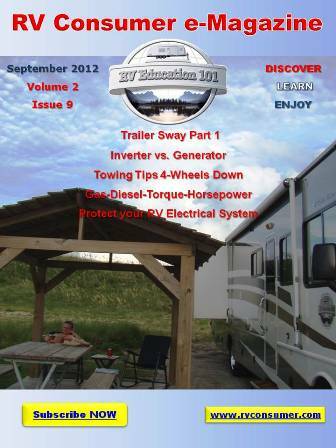 Here are my top 7 tips to help improve your RV driving and towing skills. 1). Know where your pivot point is and what it means. This applies to motorhomes and trailers. The pivot point is defined as the fixed point on a vehicle at which the vehicle rotates around in a turn. On a two axle vehicle it is the center of the rear axle. This means that if an object, for example a tree, is located at the center of the rear axle or behind, you can turn toward the object and not hit it. If the object is ahead of the pivot point and you turn toward it, you will hit it. For a tandem axle trailer the pivot point is in the center between the two axles. 2). Have an understanding of what off-tracking is and how it affects the way your coach or trailer turns. Off-tracking is the difference between the path of the front wheels and the rear wheels, during the course of a turn. 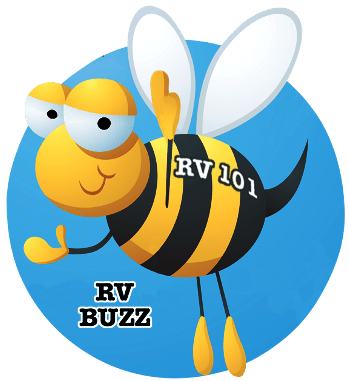 You really don’t need to know how much your coach or trailer off-tracks, you just need to know what it is and how it affects the way your RV turns. What is beneficial is to establish what Lorrin calls turn offsets. A turn offset is the distance that your RV will travel forward during a turn in relationship to how far you were away from an object when you started the turn. It basically shows you how your RV turns. To establish your turn offsets, park your coach parallel to a line and one foot away from the line (you can do this in a parking lot). Then mark the line adjacent to your pivot point. Now, turn the wheels full lock, or as far as it will turn in the direction of the line, and move forward until the pivot point you established on the coach or trailer intersects with the line. Measure the distance you have traveled from the starting mark that you put on the line, to the pivot point. This is your turn offset from one foot away. It doesn’t hurt to take these measurements turning both left and right. This gives you an opportunity to see what it looks like in the mirrors, and not all vehicles turn the same in both directions. Repeat this exercise at two, three, and four feet intervals from a parallel line. If you tow something behind your motorhome it’s a good idea to take it with you when you try this, to see where the tow vehicle crosses the line. Then you know what to expect when towing a vehicle. 3). Find out what your tail swing is. Tail swing is the distance the body of the RV behind the pivot point moves in the opposite direction of the front when you turn. To establish what your tail swing is, stop your RV with the side of parked along a straight line. Then, make a full lock turn away from the line and have someone measure the maximum swing as you turn. When we were filming the motorhome driving video Lorrin’s motorhome had a tail swing of eighteen inches, but another coach we tested had thirty inches of tail swing. In general a newer motorhome chassis will turn more sharply, which equates to more tail swing . 4). After you have your turn offset and tail swing information you will know exactly what you need to do to properly setup for a maneuver. The setup is the most important part of any maneuver. Setup is how you position your rig to start a maneuver after taking all these other factors into consideration. By setting up further away from the obstruction and starting to turn earlier, you would be able to turn into a much smaller lane or opening. Also, by knowing your tail swing you know at least how far to be from a wall or other objects before you start your turn. In traffic you will need to allow space in the lane on the opposite side from the direction that you are turning, for your tail to swing into. Something that really needs to be stressed here is don’t force a turn. If there is not enough room to make the maneuver, stop and wait for traffic to clear to complete your turn. And if it doesn’t look like there is enough room to make the maneuver, don’t do it. 5). Proper mirror adjustment is an important element to improving your driving skills. Approximately 30 percent of the hazards you will encounter come from the rear, so getting the maximum viewing area from your mirrors is critical. If you have the type of mirrors that extend out in front of your motorhome on long arms, you need to make sure the inside edge of the mirror is flush with the side of the coach. When we were filming the majority of motorhomes we inspected, with mirrors of this type, were not set correctly. The proper type of mirrors and mirror adjustment on a tow vehicle is crucial to safe towing. The best way to check the mirrors is to stand in front of your coach or trailer and sight down the side. The inside of the mirror head should look like it is just touching the side of the coach or trailer. Having the mirror flush with the side of the RV gives you the best overall view. Some motorhomes taper in on the front and can give you a false setting, so make sure you are looking down the side. On the passenger side you should set the mirror flush with the outside of the awning arms. If the mirror is too far in or out, you are losing valuable viewing area. Adjust the flat part of the mirror so you can just see the side of your RV along the inside edge and so you are looking back level with the ground about one-fourth of the way from the top of the mirror. You really don’t need to see a lot of sky. If you are towing a trailer and cannot see along the sides of the trailer using the mirrors you need to purchase and use mirror extensions. 6). Establish reference points. In a car you have a hood in front of you to use as a sight, but in a motorhome you have very little in front of you to assist in staying on course. While you are at the parking lot to establish your turn data, park the motorhome with the driver’s side of the coach on a long line and see where that line intersects the bottom of the windshield. If there is no specific reference point, mark that spot with a piece of tape or other type of marker. Then move the coach, so the line is on the passenger side, and mark the windshield the same way. This will give you your limits. These marks will give your subconscious some help to stay centered in your lane and maintain a straight course. You should also note where your windshield marks or any reference points you have established on the dash are when centered on an average-width roadway. 7). Make sure other adults who travel with you are capable and confident in driving the motorhome or towing the trailer too. It’s better to share the driving duties, or at a minimum have the ability to drive if the need presents itself.